There are some beautiful word pictures in this week’s passage (Colossians 2:6-23)(Week 4 of Complete in Christ). But, the one that stood out to me most was Paul’s contrast between death and life. Could there be anything more opposite? If rating oppositeness was a thing. I think there’s nothing more distinct than the separation between being dead or being alive. The finality of death. The freedom and potential of life. The false teachers in Colossae are going on about rituals and asceticism, which at face value seem to promote spirituality, but in the end, only promote themselves and their self-reliance. Paul’s message to the Colossians is that a rules-based religion isn’t the road that leads to life. The only one with the power to bring the dead to life, is Jesus. He took our record of debt. He paid it by his blood. His death, gives us life. The picture in my head is the scene of Jesus’ crucifixion. In a traditional crucifixion, the Romans would list the debt or crime of the criminal being crucified and nail it to the cross. So the world could see and be warned of what can happen to you if you break the law. Be warned, world. If you break these rules, you could be next. Now, I see Jesus. Soldiers are lifting up his cross to be dropped into the ground. And above his head is the list of his crimes. But, it’s not his crime — it’s mine. My name. My sin. “His dying breath has brought me life,” just like that great worship song says. The debt is canceled. Jesus died for Jenni and because of his blood, she lives. Why do we listen to any voice outside of the simple truth of Jesus, and convince ourselves there are “other” requirements? Extra credit can’t raise the dead. My activities, my good works, my sacrifices for others – these are all good things. But, they don’t fill my lungs with oxygen. The way to life is as simple as walking in the truth of our canceled debt. 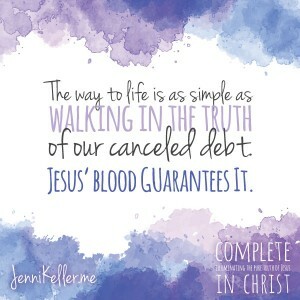 Jesus blood guarantees it. Jenni, you have done a marvelous job in this study. I am enjoying it so much. Thank you for being obedient and assisting the Holy Spirit to disk through you in this way. Julie, you are too kind. It has been such a blessing to listen to women share how God is speaking directly to them through Colossians. I enjoyed writing it and look forward to writing more! I have solo much trouble with second guessing my salvation. You know, the “Am I good enough?” syndrome. I KNOW Jesus died for me and I believe He is more than enough to redeem me, but I think that the worlds philosophy of ‘nothing in life is free’ has been pounded I to my head so much that I have a hard time trusting Grace. Does that even make sense to anyone else? That does make sense, Beth! You’re not the only one who wrestles with Grace. I encourage you to keep pressing in on this issue with God. He will continue to reveal himself and assure you of his love! And you can purchase and jump in on the study any time. You only missed the kick-off! Consider gathering a few friends and going through it together! Oh! I forgot to mention that I just stumbled across this study and am so sorry that I missed the first four weeks!! Amen! The love of Jesus is so amazing! So easily I get caught in the trap of doing more for Jesus. So silly, really. He doesn’t need me to do anything for Him. He’s already done it all. It’s just a transition in our hearts, really. Like when I make pancakes for my kids at breakfast. It’s not to earn their love, it’s to show them mine!